Yale professor Robert Shiller has made some huge contributions to the financial industry. Best known of course is the Case-Shiller housing index, which tracks house price data for the US. Not quite as well known is his Cyclically Adjusted Price to Earnings ratio, or CAPE. 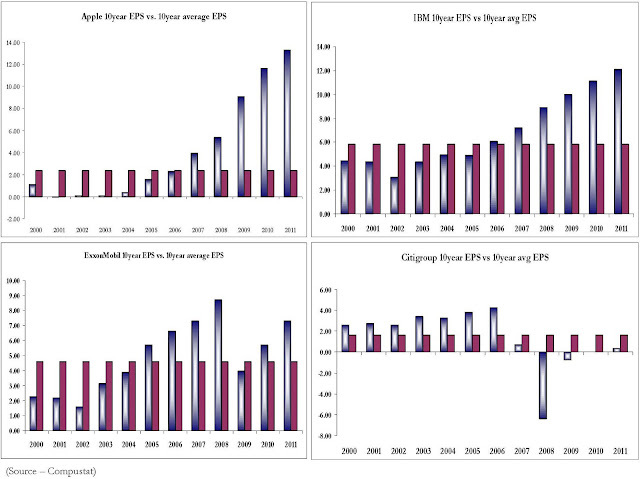 Essentially, it "normalizes" earnings over a 10year period, rather than valuing the market at peaks and troughs. 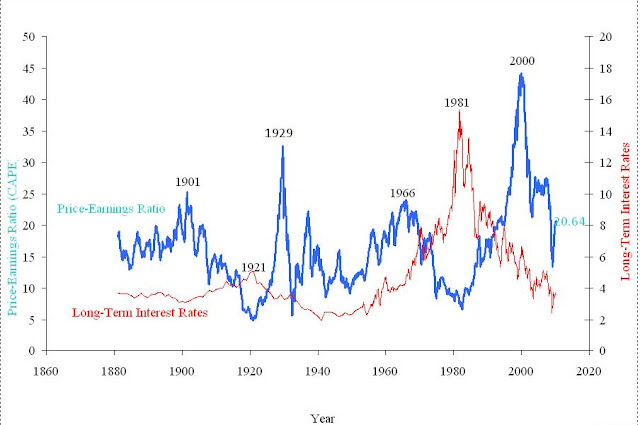 With that in mind, the market right now is trading at 20.6 times earnings, based on Shiller's 10year average earnings. According to the historical data, that would imply a 10year return of about 4% annually, based historical results. 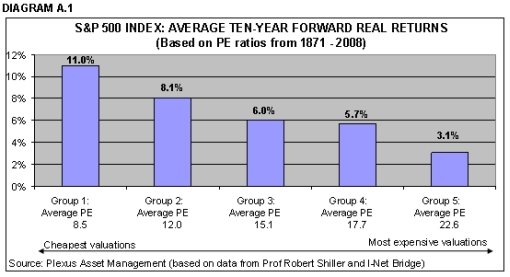 The big problem with the Shiller PE becomes apparent once you look "under the hood," at the data. The market's current PE of 20 based on Shiller's data doesn't make much sense once you examine the actual stocks involved. Take Apple(AAPL) for instance. The cyclically adjusted earnings used for the CAPE analysis is $2.38, compared to the $9 they earned in 2009 and the $11.64 expected this year. It's certainly legitimate to argue that margins and earnings will "revert" to a lower mean, but putting a 15 PE on Apple's cyclically adjusted earnings would be a stock price of $36, or 84% below where the stock trades. That would be slightly above the $27 in cash per share on Apple's balance sheet!!! Another example of the problem with cyclically adjusted PE ratio would be Citigroup, whose 10year average earnings per share is $1.62. If you want to value the company based on that number, be my guest. But be aware that in 2011 Citigroup is expected to earn 34cents. Paying 12 times the 10year earnings figure would put the stock at $20, or 400% above current levels. The Shiller PE is extremely useful, but it shouldn't be an excuse for people to avoid digging into the individual stocks making up the market. Instead of the S&P500 trading at 20times earnings, I find it closer to 11-15 times earnings, based on 2009-2011 earnings. 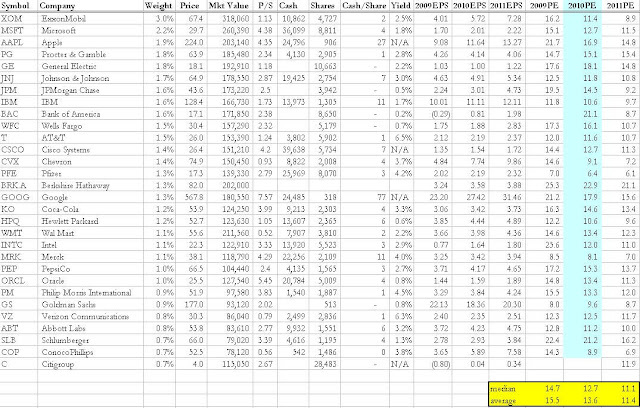 It would be even lower except for Berkshire's high PE, which is misleading due to the way it's ownership positions are valued. Shiller's CAPE will definitely encourage buying the market at cheap valuations, but it can also make the market look severely overvalued...unless you think Apple is worth one times 2009 earnings, after pulling out their $27 in cash per share.